Let’s peer through the fog of events at the place where we now find ourselves. Americans are unhappy with their politics, unhappy with their politicians, distrustful of their government to an almost pathological extent. To people of the left, our system of government is a puppet show performed for the enrichment of Big Business oligarchs. To people of the right, it is an instrument of tyranny wielded by Big Government elites. The impact of the public’s distrust is such that these venerable categories, left and right, explode into bits. What does a Tea Party activist have in common with Mitt Romney? What ideals or habits of life does a “social justice warrior” share with Hillary Clinton? Romney and Clinton ride the top of the pyramid: Walter Lippmann, that sincere elitist, would call them “insiders.” The others are on the outside, looking in. Their wish to obliterate the hierarchy trumps their considerable differences in ideology. Political unhappiness isn’t a uniquely American condition. It’s universal among the old democracies. The president of France, François Hollande, elected just a year and a half ago, has broken records in unpopularity. The government of David Cameron barely avoided presiding over the dissolution of the United Kingdom. Italy has been incapable of holding meaningful elections: the current prime minister, Matteo Renzi, though popular for the moment, is essentially unelected. Government as such is in crisis. Democracy has lost the authorizing magic of legitimacy. So: those of us, here in the US or anywhere on planet Earth, who find far more good than evil in the democratic system of government, must account for its present sickness and specify the path back to good health. The crisis of government isn’t about economic mismanagement. Such mismanagement has been habitual and appalling: no sane observer will dispute that. Government blessed the drunken-sailor bets placed on “subprime” securities before 2008. Government then enacted a trillion-dollar stimulus in 2009 that, by its own measures, achieved nothing. This is an old story. Franklin Roosevelt assumed the presidency under much grimmer economic conditions than we now experience, and ten years later, on the eve of World War II, little had improved under his management. But the public kept faith. The many new institutions FDR erected were mostly stage business: but they possessed legitimacy. Given trust and legitimacy, democratic government will survive mismanagement. Nor is the crisis about our geopolitical difficulties in a world that “is exploding all over.” John Kennedy was humiliated face to face by Nikita Khrushchev and more indirectly defeated at the Bay of Pigs, yet he kept his standing with the public. Americans rallied to a president facing trouble in the world, and JFK could tap into this reservoir of trust and good will. Certainly, the crisis of government isn’t about conspiracies spun by evil geniuses who manage to be invisible and irresistible all at once. Self-interested conspiracies have always circled political power: but consider the empirical claims being made. Barack Obama isn’t George III. The accusation is laughable at very many levels. The Koch brothers haven’t purchased any portion of the US government. Their total worth couldn’t buy one day of Medicare disbursements. It is a judgment on the intellectual capacity of our age of distrust that a weak, floundering president and a pair of rich political dilettantes can be portrayed as American tyrants. These conditions – a bad economy, a disordered world, the paranoid style – infect our democracy only because our democracy was already sickened, already stripped of immunity to the predictable troubles of political life. The supposedly life-and-death issues that divide the electorate are in truth surface symptoms of an underlying malady. The supreme question that history has placed before us concerns a fundamental choice in politics: the distance between rulers and ruled. Great democratic institutions – presidents, parliaments, executive agencies and regulatory bodies – have come to perch atop structures that magnify immensely their remoteness from ordinary people. Distance is manifested literally, physically. 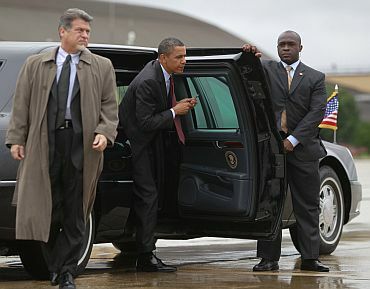 President Obama moves about by helicopter and motorcade, protected by hundreds of armed Praetorians. When he attends a baseball stadium, fans are told to show up hours early, so they can be duly frisked before the game. These procedures are a symbol of the profoundly undemocratic spirit of our democratic institutions. Rulers and elites hide behind massive bureaucracies ringed by nervous security. Nobody knows what they think, or why they think it. On occasion, they allow themselves to be questioned by fellow elites from the media. The questions are insider questions. The answers are insider answers. The public’s concerns, being a mystery to questioners and answerers alike, are never broached. Congress enacts bills that are hundreds of pages long and written in incomprehensible language. Bureaucrats interpret, and though obscure and unelected, become true legislators. Regulators, also often unelected and unaccountable, add another degree of separation. The Federal government plays favorites among the thicket of laws, which to implement and which to waiver. Elected officials of all stripes and denominations form a party of sorts: the party of distance. Government is lost in the Olympian heights, and the public encounters the democratic system at the level of the metal detection machine and the TSA body scan. In the digital age, this will not stand. It will not stand because the public, too, forms a party of sorts: the party of rejection. The weakness of Hollande in France, Cameron in Britain, and Barack Obama in the US can be reckoned in direct proportion to the force of this rejection. Once a polite audience, the public has leaped onto the stage of history and wishes to play the hero. Its loud, persistent voice can be heard on digital platforms everywhere and at all times, reflexively cynical, offering the most sinister interpretations of government failure: attacking, condemning, rejecting. Traditional issues of political life, like unemployment, like war and peace, have become proxies to the relentless struggle of the public against the established order. Distance induces blindness in rulers, blind distrust in the ruled. That is the crisis of government and the sickness of democracy, in brief. This is not the place to describe the cure in detail. The general approach, however, shouldn’t be much of a mystery. Obviously, the steep Federal hierarchies will have to be flattened, to bring them into greater sympathy with our networked age. Obviously, aristocratic perks and protections, the motorcades and the bodyguards, will have to be reduced to a minimum or eliminated entirely. Obviously, laws will have to be of a length that can be encompassed by an ordinary intelligent person, and written in American English. But such ideas amount to navel-gazing of the most useless kind, unless American politicians dare to move out from the shallow end of the pool. They will have no reason to do so until the public forces them. Ideology is no barrier to action. Those who believe in political power as a force for good need a trusted and legitimate government for their instrument. Those who believe political power must be limited and bound to the people will find in the reduction of distance a congenial project. Only trolls and nihilists will object to turning away from a self-destructive path: but let’s remember that it is precisely the troll and the nihilist, the party of suicide, who often set the tone for American politics today.